More than 4,000 years ago, the ancient Greeks invaded the rugged hills and fertile plains of the Balkan Peninsula, and in the centuries that followed, they built one of the greatest and most influential civilizations in history. Their enduring legacy to modern society includes mythology, poetry, drama, sculpture, architecture, science, and political thought. 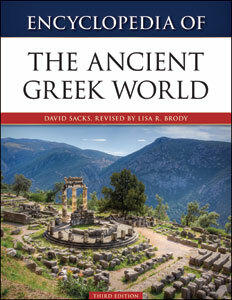 Spanning more than 2,000 years, from the beginning of Minoan civilization in the third millennium BCE to the Roman annexation of mainland Greece in 146 BCE, Encyclopedia of the Ancient Greek World, Third Edition provides a comprehensive survey of the classical Greek world. Further readings accompany major entries and a new glossary defines hundreds of specialized terms relevant to the field. A general bibliography and several detailed maps complement the text. Authoritative and accessible, this highly readable reference work is ideal for students and general readers alike. David Sacks holds an M.A. in Greek and Roman history and literature from Oxford University. His articles on current cultural topics have appeared in The New York Times Magazine, The New York Times Book Review, Vanity Fair, The Wall Street Journal, and other publications. Lisa R. Brody, reviser, has a Ph.D. in Classical art and archaeology from New York University's Institute of Fine Arts. She has taught at Willamette University, the American School of Classical Studies in Athens, Oregon State University, and the University of Notre Dame. Brody has conducted archaeological fieldwork at sites in Greece, Turkey, and Portugal. She is associate curator of ancient art at Yale University Art Gallery and cocurated Dura-Europos: Crossroads of Antiquity, which was on view at the McMullen Museum at Boston College and at the Institute for the Study of the Ancient World at New York University. Her publications include Aphrodisias III: The Aphrodite of Aphrodisias.